Every reader of Zinda Magazine recognizes the challenges facing the Assyrians today; some continue to analyze the issues and others offer solutions through their letters, articles, and discussions via television programs and Internet forums. Hardly any of us take the first step to execute any of the proposed solutions. Today, the focus of the Assyrians around the globe is Iraq. Assyrians are mistreated in their own ancestral homeland and forces to abandon their villages and homes. In order to resettle the Assyrian refugees, peaceful negotiations must be underway in Washington and Baghdad. Assyrians must promote their cause with a global effort to increase public information campaigns around the world and secure millions of dollars from various sources to solve their immediate problems in Iraq. Enter Operation Tammuz! Building an international movement around the issue of rebuilding the villages and places inhabited by the Assyrians in Iraq and resettlement of the Assyrians in Iraq requires a sophisticated infrastructure that will consistently mobilize the Assyrian resources and public opinion in solidarity with Assyrian people. 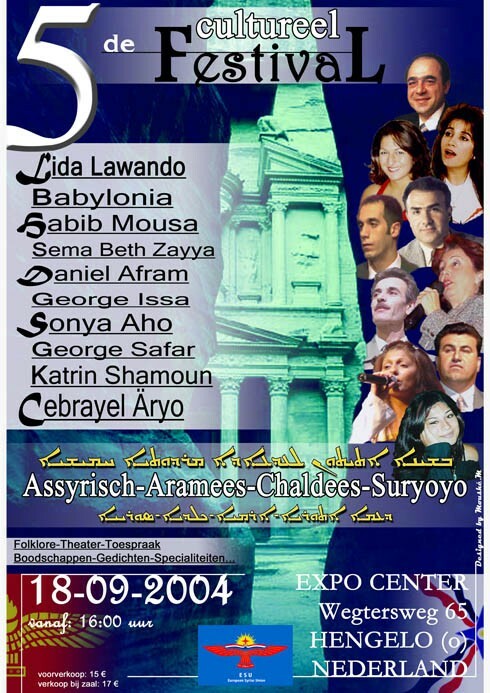 The ultimate aim of the Operation Tammuz is to organize Assyrians (also Chaldeans and Syriacs) in the diaspora and to develop their skills so that they can assist the ChaldoAssyrian population in Iraq and other Middle Eastern countries in developing the professional, political, and cultural institutions of a future Assyrian administrative region in Iraq. Operation Tammuz will bring Assyrians together based on shared professional skills and interests; from various countries around the world. The Operation is expected to involve thousands of Assyrians across the entire spectrum of political, professional, and cultural life by mid-2005. Operation Tammuz is not directed under the aegis of any current Assyrian organization in the Diaspora. The leadership and subcommittees of every group or union will be structured democratically by its own members when a certain critical mass (twelve members) is reached within each group and after certain amount of time in the near future. For instance, the members of the various political parties are expected to be represented within the "Administration Professionals" union, each representing their group's ideals and future plans. In general the establishment of Operation Tammuz emulates the nation-building strategy proposed by the earlier Assyrian nationalists including Naom Faiq and William Daniel. In a few months, members of Operation Tammuz will form a movement that will mobilize and organize the Assyrian youth, students, and professionals around the world, creating a network of contacts - twelve members to each active network team - that will share useful and effective information for public dissemination through the media and all current Assyrian organizations - including the churches, political parties, media, and youth groups. The focus should be making the ongoing maltreatment of the ChaldoAssyrian population in Iraq more visible. Zinda Magazine appeals to all its readers to join our staff in developing the first global network of Assyrian activists to strengthen the support of the Assyrian people and their rights in Iraq and other countries in the Middle East. In particular, Zinda Magazine calls on every Assyrian student and young adult in the Diaspora to support Operation Tammuz by signing up today and help prevent the biggest threat to the survival of the ChaldoAssyrian population of Iraq. To make a difference and to learn more about Operation Tammuz write to Zinda Magazine at tammuz@zindamagazine.com. Questions and concerns will always be with us as we continue to over-analyze the impending issues in Iraq and the Diaspora. The Assyrians in Iraq and elsewhere need our help. The time to act is now. Stay informed by reading Zinda Magazine and become active in building a global nation in the Diaspora and an administrative region in Iraq. The official registration site of Operation Tammuz will be made available to public next Wednesday, September 1st. The population figures from the nineteenth century up to modern times ranges from some 2,500 to 20,180. Hurmiz Aboona states that in 1850 there were 250 families in Alqosh. In 1867 – 1868, Patriarch Joseph Audo visited his congregation in north of Iraq and stated that Alqosh in 1868 had 2,477 persons. Scholar Joseph Shikho visited Alqosh in 1895 and stated that its population was 5,000. In 1913, Fr. Joseph Tifankji wrote that Alqosh population at the turn of the twentieth century was 7,000. In 1937, Fr. Estefan Kajo (later bishop) conducted a census of the town and recorded the population at 8,475. In 1950, Fr. Raphael Bidawid (later patriarch) conducted another census at the request of Bishop Estefan Kajo and reported the population at 9,500. In 1961, scholar Giwargis 'Awwad put the population at 7,000. Today, the population, which is all Assyrian (also known as Chaldeans and Suryan), is estimated at 6,000. The name Alqosh (or Elqosh) is derived from a compound Assyrian Akkadian name Eil-Kushtu, where "Eil" means God and "Kushtu" means righteousness or power. Therefore, Elqosh, or as casually pronounced Alqosh, means "The God of Righteousness" or "The God of Power." The name "Alqosh" could also be originated from the Aramaic "Eil Qushti," which means "The God of the Bow." 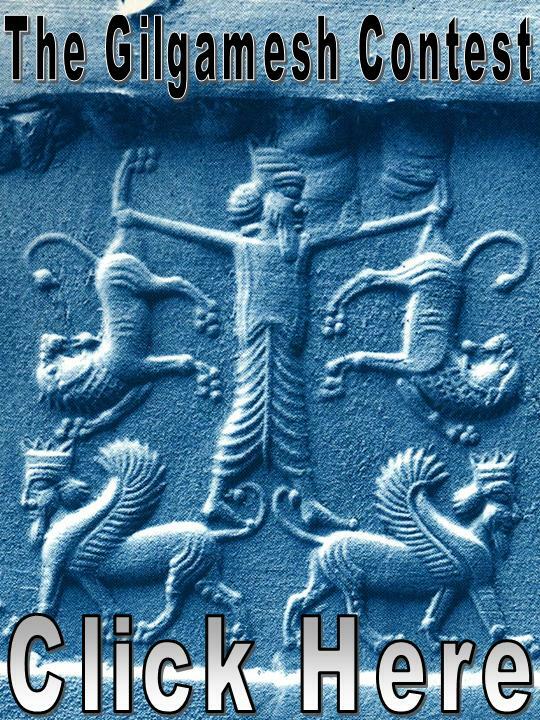 Here, an association could be drawn in conjunction with the winged disk symbol of God Ashur holding a bow. Meanwhile, in Aramaic language, rainbow is referred to as "Qeshta d' Maran," therefore, the meaning of the "Bow of Our Lord," is possible as well. Alqosh is known also as Yimma d' Athor (Mother of Assyria) or Yimma d' Mathwatha (Mother of all Villages). Mar Giwargis Church. Perhaps the first church in Alqosh, however, the present structure dates back to 1906, which was built after the old church was demolished in 1904. Certain manuscript dated 1680 refers to the church. Mar Qardakh Shrine. Ground breaking for this shrine took place in 1937. It was built to commemorate St. Qardakh. St Qardakh was a Zoroastrian, however, he converted to Christianity and insisted to remain Christian even when threatened by Sassanid King Shapur to be killed. Mar Qardakh was stoned to death in A.D. 359. Alqosh is an old Assyrian settlement, most probably older than 800 B.C. It gained popularity perhaps because it is mentioned in the Old Testament in connection with Prophet Nahum, who preached in Assyria between 726-697 B.C. It is worth mentioning that Nahum is buried in Alqosh. The presence of the Seat of the Church of the East patriarch in Alqosh, gave the town a special importance for the Assyrians and foreigner alike. The depository at the Monastery of the Rabban Hurmiz contains valuable manuscripts and documents about the history of the Church. Alqosh was the main source for manuscripts for all the villages of the Nineveh (Mosul) plain between the sixteenth and nineteenth centuries. Scribes, throughout the centuries, have copied manuscripts for the monastery, including only for an example, a prolific priest Joseph son of priest Giwargis, who copied at least twenty-six manuscripts from July 1696 to May 1738. Many studies have been made about this wealth of information in the town. One of such study is "The School of Alqosh: The Literary Culture of the Church of the East Between 1550 and 1800." This is a project that started in the late 1990’s and resulted in the publication of a dissertation in 2002 (Alessandro Mengozzi, Israel of Alqosh and Joseph of Telkepe: A Story in a Truthful Language and Religious Poems in Vernacular Syriac (north iraq, 17th century) through Corpus Scriptorum Christianorum Orientalium 590 & 598, Peeters, Leuven 2002). The project included in addition a number of articles. The project is planned to be completed and published in 2005 with a monograph on the cultural history of the church of the east in the ottoman period in northern Iraq, covering themes such as the interaction with the west and the western church, the renewal of the manuscript tradition (including the production of manuscripts), and the writing of Neo-Aramaic. During the period of 958 and 978, many of the villages of the Mosul Plain witnessed destruction due to the war between the Hamdanites and Buyids. The Buyids, a tribe from the fringes of the Caspian Sea, had controlled the region in one way or another from 945 to 1075. Between 1258 and 1401, the Mongols (after adopting Islam) and later Tamerlane (Taymorlang) attacked the Christian villages, Alqosh, and its monastery. The monks were forced to flee. The monastic life returned to the monastery a few years after, but on a smaller scale. In 1832, Whilmshurst reports that Alqosh was attacked again by the Soran Kurds of Rawandos. Some 300 of Alqosh's inhabitants were killed, the survivors were robbed, and the tomb of Nahum destroyed. According to church records, the Kurdish leader Merkor attacked Alqosh again on March 15, 1833, and killed another 172 of its men, beside children and women. In 1840, Alqosh was attacked by the brother of Merkor, Rasoul Beg, who surrounded it for several months after which he put on fire the Rabban Hurmiz Monastery and stole over 500 of its valuable books. In 1850, the monastery was raided again by Kurds and over 1,000 manuscripts were destroyed when a stream flooded a small building in which they have been stored. In 1879, a famine hit Alqosh hard and suffered great loses. In 1902, a cultural disaster fell upon the Assyrians and to the town of Alqosh. During this time struggle between the Nestorians and the Catholics were at its greatest limits. A group of the missionaries arrived from Mosul. They told the residents that they were collecting all the rare books and moving them to a library in Mosul. Many people gave their books away. Then, the missionaries removed all the valuable books that date to the fourth century from a secret room inside Mar Mikha al-Nuhadri and gathered all these book at the yard of the Mar Mikha and burned them. This story was told by Yousif Kado (1892 – 1971), a priest of Alqosh and the principle of its school in early twentieth century. Alqosh has been an Assyrian town since time immemorial. It was the seat of the patriarchs of the Church of the East for many centuries. The Assyrians (known also as Chaldeans and Suryan) are facing dangerous times due to the aggression, oppression, persecution, Arabization, and lately Kurdification policies. Alqosh must be joined with the other Assyrian towns in the Nineveh plain, such as Karamlesh, Bartella, Baghdeda, Baqufa, Tellosqof, Batnaya, Tel Kepe, and others as a special administrative region, within the Republic of Iraq, for the Assyrian Christians. History has proved that this is the only way that can guarantee the survival of the indigenous Assyrians on their ancestral lands. The designated Iraqi ambassador to the Vatican, Mr. Albert Yelda, an Assyrian, appealed to his nation's Christian minority yesterday not to turn their backs on their country. Yelda, who will take up his post in Rome as soon as the Vatican accredits him, estimated that "less than 1 million" of his country's 23 million inhabitants are Christians. Reached by telephone at his Baghdad office, Mr. Yelda, pleaded with his co-religionists not to forget that "we are the descendants of the original residents of present-day Iraq." Referring to the bombing of five Iraqi churches earlier this month, Yelda insisted: "This was the work of foreign terrorists. Iraq's Muslim leaders do not want us to leave. Christians enjoy their highest respect." Yelda's appeal came in the wake of an exodus following the attacks on the churches, causing the death of a dozen Christians; 50 more were injured. As a result, some 40,000 members of different Christian denominations fled their homeland, according to Pascale Ishoo Warda, Iraq's Immigration and Displacement minister. Albert Yelda is himself a returnee who had spent most of his adult life as a refugee in the United Kingdom, where he had fled while officially under house arrest at age 16 in Baghdad. Yelda is veteran opponent of Saddam Hussein's dictatorship. As a 12-year-old boy, he led school rebellions against Saddam's regime in Baghdad and helped found the Assyrian "Black Palm," an organization fighting what he later called Saddam's attempt to "Arabize" the Assyrians by suppressing their language, Aramaic, which is closely related to the language of Jesus. "Saddam Hussein was engaged in a campaign of cultural genocide," Yelda used to say during his stay in London, where he was one of the leaders of the Iraqi National Congress, then the largest opposition movement in exile. Mr. Yelda and Mr. Iyad Allawi, the current Iraqi prime-minister- co-founded the Iraqi opposition group called the Iraqi National Coalition in London in the mid 1990's. The organization was a member of the Iraqi National Congress. He said he empathized with Christians fleeing Iraq after the latest wave of attacks--including rapes--on young women working for the American military and foreign corporations. But, he added, "Christians must not give up their properties here. If they want to flee the violence, which is not the work of local Muslims, they should rather go north to Kurdish territory, and then come back when security in Baghdad has improved." In a sense, this is already happening. Assyrians are returning in droves to Kurdistan whence they had escaped after the destruction of their villages on Saddam's orders. "Not a day goes by without a family contacting me wishing to come back, especially since the terrorist attacks in Baghdad in early August," Patros Harboli, bishop of Dohuk, told Le Figaro, the French national daily. His colleague Raban Qas, bishop of Amadia, related that 150 Christian families had requested help for their repatriation to his diocese. "Everything has to be rebuilt here--houses, roads, schools, dispensaries. They were all razed by Saddam Hussein," he said, according to the French paper, which also reported that local Muslims provided significant assistance to returning Christians. Meanwhile in the capital, prominent Muslim clerics and political leaders keep telling Albert Yelda that they do not want to see Christians sell their property and move across the border to Jordan, Syria and then on to the West. "They go out of their way to show us their respect, inviting our patriarchs to all major events," he said, "and they roundly condemned the attacks on our people, the bombings of our shops, the rapes and the killings." After five churches were bombed in early August, many Christians stayed away from their houses of worship. But now that the government is providing better security for them, Yelda concluded, "church services are as well attended as ever." Some Christians are returning from exile in Western Europe, Australia and the United States, especially the Chicago area, home to the largest group of Assyrian Christian expatriates. "They are business people, physicians, lawyers and teachers willing to invest in Iraq and participate in the reconstruction of its society," he said. Some deceived individuals, motivated by certain authorities who are known to all by now, have exceed the proper limits in their hopeless attempts to divide, an act that serves only the enemies of the Assyrian Nation. The Ancient and contemporary Assyrian history is full of such attempts made to falsify our identity, language, and civic heritage. At times such attempts would appear as ecclesiastical and at times as direct foreign interventions. Until recently these deceived individuals were competing with each other in issuing declarations and leaflets advocating the Arabisation of our people and promulgating Pan-Arab ideologies (with all due respect to our Arab brethren and the Arab Nation). They never recognised their unique national ethnicity or honoured their historical identity and origin. However, after the unexpected changes in Iraq, specifically subsequent to the fall of the notorious and fascist Dictator, these individuals flung in to the camps of certain parties who are antagonist to the national existence of the Assyrians, these parties were waiting for such an opportunity to penetrate the Assyrians from within, so they can upset the Assyrian political arena and exploit this to shape future Assyrian national demands. By eradicating our history, engulfing our rights, forging our identity, they attempt to break up our national characteristics. All this is taking place in a time when we are in dire need for unity and alliance, through which we can confront such marginalizations and the dwarfing of our aspiration as a nation. Due to the iron resolve of our people, and despite all those bitter and hard experiences which we endured for centuries, these (compound) sects or groups could not, and shall not accomplish their desires or fulfil their personal goals. All such attempts were shattered as they challenged to shake the solid foundation of the eternal Assyrian Nation, held through blood, sweat and tears of thousands of zealous Assyrian men, women, and children. At the same time we call our people to cast away and eradicate these tendencies that are supported by foreign powers who resent our unity. No nation is exempted from such abnormalities. However, these cases will never triumph, their results are only transitional, and time will attest to this fact. Our people suffered many annihilation attempts, and gave great sacrifices for the sake of freedom, dignity, and honour. This shall not go in vain, and we will not forsake them but we will hold to it, today more than ever. We shall confront and transcend these dubious trials triumphantly, as we have done in the past. By gaining our legitimate rights on our ancestral land as an indigenous people, deeply rooted in that land and not as a minority or majority that some propagate it to be. • Confront these blemish attempts that are trying to falsify the historical facts, and obliterate our national identity. • Appeal to the Iraqi Official Authorities to maintain the name of our nation as "Assyrian" in the forthcoming census. With our esteemed respect and appreciation. 2- Assyria Liberation Party (GFA). 5- Assyrian National Organization (ANO). 01- Beth- Nahrain Cultural Club, (Norsborg- Sweden). 02- Assyrian Cultural Club, (Idstein- Germany). 03- Assyrian Youth Club, Gütersloh ( Germany). 04- Assyrian Youth Cultural Club, Darmstadt (Germany). 05- Nineveh Assyrian Club, (Germany). 06- Assyrian Youth Cultural Club, (Germany). 07- Nineveh Athletic Club (Wiesbaden- Germany). 08- Assyrian Hammorabi Club, (Belgium). 09- Assyrian Syriac Club, Fiel (Swisserland). 10- Committee ( Assyrian International Seyfo Genocid). 13- Assyrian Human Rights Committee. 14- Assyrian Canadian Lobbying Committee. 15- United Assyrian Youth of Canada. 17- Assyrian Social Club – Chicago, (America). 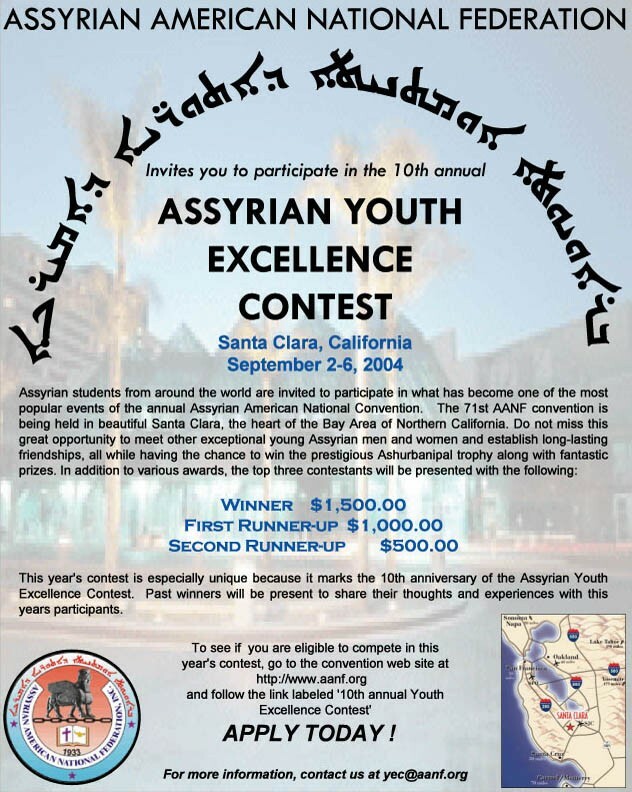 18- Assyrian Orhai Organization (California- America). 19- Assyrian Australian Foundation, (Australia). 20- Syriac Youth Association, (Germany). Four representatives for the Chaldoassyrians!? And Eight for the Turkomans ... I am unable to understand how it's possible. Our people represent 1 million on 24 million total population and we just have 4 representatives. It is dramatic. We need a serious lobbying activity. I cannot believe it: Eight representatives for the Turkomans. And just Four for Chaldoassyrians. Hundreds of thousands of Assyrians-Arameans-Chaldeans-Syriacs are living in several European countries. Due to this fact cultural links and relations arose between the old civilization of Mesopotamia and the modern civilization of Europe. Since the year 2000 big international cultural festivals are organised annually with the goal to develop and to present the art and the culture of our people, which has its origin in Mesopotamia, the cradle of the civilization. This year’s cultural festival will take place on September 18th in Hengelo, the Netherlands. We believe that these and other similar events will promote the friendly and solidarity relations between people and that they will be useful for a democratic society. We would be pleased to welcome you as a guest to the V. International Festival of the Assyrian-Aramean-Chaldean-Syriac people. Please contact us in time if you would like to make a speech or to send a message to the festival. “Peace be unto you and welcome to our shores,” appeared to be the beaming remarks of a silent, benevolent friend—the full moon—as she unveiled her luminous face from behind the dark-blue horizon of the majestic, Pacific Ocean. The caravans in the drifting sands of the Gobi Desert, and those treading across the misty Kheybar, Karakorum or the Kilimanjaro mountains risen hoary to the heavens, had already been guided to their various destinations in the Orient by her beneficent torch. Now it was the turn of the weary travelers from the Occident to be led into the cosmopolitan emporium of the West Coast and Gateway to the Far East, the city of St. Francis, where the 32nd annual convention of The Assyrian- American Federation would be held for the first time since its inception. The Oakland-San Francisco Bay Bridge connects the east coast with the west coast. It now remained to the Golden Gate Bridge to link the Federation with her compatriots on the other side of the oceans, a policy to be considered, pursued and adhered to very seriously hereafter. President John Yohannan called the convention to order with prayer by Rev. Lootar Hoobyar on Friday morning September 3, and immediately after the Invocation he appointed Jack David, Jr., Managing Editor of the Star, his parliamentarian, alternated occasionally by attorney Calvin Moorad. To those who had traveled thousands of miles from the east and mid-west, and who had already seen many conventions of the Federation, the solemnity of the occasion was neither a novelty nor unusual. But to our Californian associates the forensic, parliamentary proceedings and the sophisticated nature of the business transactions appeared to have aroused admiration and inspiration. What once upon a time had caused indignation and indifference to join the Federation, was now admitted to have been a mistake or misunderstanding. The former suspicions about the noble aims of the Federation were now substituted with trust, healthy attitudes and promises of support. Henceforth the Federation was therefore one giant step forward in her future aspirations. Personal contacts and interviews under the present circumstances are always more effective and fruitful than communication in absentia. One big advantage of holding the convention in California was the probing of personnel and personalities for the future needs of our great Federation. Surely there will come a time when we shall have to elect high ranking officers from that region too. It is encouraging to know that we do have potential leaders in such persons as Fred Tamimi, John Abraham, Walter Shahbaz, Lincoln Isaac, Youel A. Baba, attorney Calvin Moorad, Frank Chavoor, Sam Jacobs and many others, who, on account of their deep knowledge of the historical background, the languages and the psychology of the Middle-Eastern countries as well as of the West, qualify for offices in the National Executive Council. Moreover, in order to consolidate the unity achieved recently, it would be appropriate to have few officers in the Federation from the Pacific coast next year. History and common sense will justify the wisdom of such a policy. As for the social aspect of the convention, it was impressive and entertaining. The nightly dances, The Ladies’ Fashion Show in particular, the tour of the city and sports were but a few of the entertainments which had attracted so many different Assyrians from all walks of life like never before. * John Abraham, his faithful spouse Amy, and his committee are to be highly commended for a job well done. Congratulations also to the California Assyrians for their wonderful cooperation and response to make their convention a memorable one. In his address to the convention body, Mayor Enoch S. Christofferson of Turlock said, “May we congratulate the local Assyrians for their aggressiveness in setting goals and having the ability, the courage and the determination to reach them. You are builders, you are courageous and you have made a success in your community and greatly helped to build Turlock” (See full text of Mayor Christofferson’s address elsewhere even Professor Jonas Greenfield of Berkeley University was enjoying himself in the company of Assyrians! in this issue.) Besides, California has not only a healthy climate, fertile soil and plenty of sunshine, it also has a host of beautiful and charming women— Nos Femmes—! Could that be attributed to eugenics, euthenics, to Queen Semiramis’ multiple re-incarnation, or to the secret Beauty Shop Venus has especially for the Assyrian femininity west of the Rockies? Folks, come let us all go out and settle down there, and rename the state “New Assyria,” U.S.A., to emulate New York, New Hampshire or New Jersey, etc. From past experience one might deduce that the President of the Assyrian-American Federation has more headaches and worries than the Chief Executive at the White House. But he who does not tire, tires adversity, and that is exactly what John Yohannan and his entire staff did last year. That is why they were unanimously re-elected for a second term as was obvious from the very beginning at the convention. Although previous administrations, including the Star, had already paved the road to affiliate the west coast organizations with the Federation, nevertheless it was during Yohannan’s term of office that such a unity was finally realized. Of course, the attitude of the affiliates towards the Federation will always be the determining factor in its stability and future progress. Let us hope that this unity will spread out into the other parts of the world where our ethnic brethren can benefit from its noble aims. 1. Introduction of the Toastmaster—by John Abraham, Convention Chairman. 2. Lootar Hoobyar (The Assyrian Caruso of the Gospel world ) —Toastmaster. 3. Flag Presentation—By Twelfth Naval District, U.S. Naval Base, S.F. 5. Songs by: The Sweet Adelines of Oakland— Mrs. Cole in charge. 6. Introduction of the Host Club Affiliate—President, John Abraham. 7. Supervisor Peter Tamaras—Representing Mayor John F. Shelly of S.F. 9. Presentation of Awards: Golf—By Ernie Nevers; Bowling—by Pappy Waldorf; Swimming—by Linda Mattox. 11. Malcolm L. Karam—Editor, Assyrian Star and Chairman of Awards and Honors Committee. 12. Lincoln Tamraz—National Commander of AM VETS. 13. 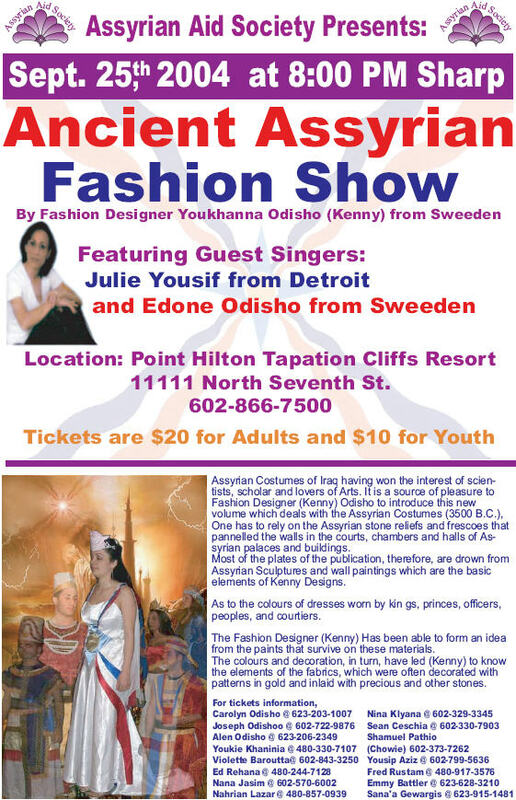 John Yohannan—President of the AssyrianAmerican Federation. 14. The Honorable George Christopher—Speaker of the Evening. 1. Presentation of President Lyndon B. Johnson’s personal picture and letter of recognition of the Federation to the convention body by his special appointee Mr. Lincoln Tamraz, national Commander of AMVETS. Personally I think this recognition of the Federation by the White House and the Greatest Man in the world is in itself a great honor and accomplishment for the Federation, something unprecedented and exceptionally unique in simplification. The Assyrian of the year: Mr. George Mardinly. The Affiliate of the year: American Assyrian Association of San Francisco. The Honorary Assyrian Citizen, Mrs. Cathy Pera, Executive Secretary of the Federation, Philadelphia, Pa.
Francis Gabriel – For art work displayed at the convention, Philadelphia, Penn. William Warda – Treasurer, Assyrian Star, Gary, Indiana. Monday, Labor Day, the conventioneers were in Turlock for the final rendezvous of the annual event – the picnic, sponsored by the Assyrian Civic Club of that city, which joined the Federation but a short while ago, and which deserves applause for the terrific job they did by way of feeding and entertaining almost 1500 guests that afternoon. Under the direction of Mr. and Mrs. Fred Tamimi and other coworkers nothing could be amiss the occasion. By 9 p.m. that evening the whole show and the 32nd annual convention were over. Conventioneers departed reluctantly loaded with happy memories and indelible impressions. For them, time, space, distance or money had no significance as long as they could partake of the blessings of an occasion which essentially was for the ultimate good of all fellow Assyrians in this great America as well as in other parts of the world. God bless this country. Let us hope that hereafter the Federation will venture out beyond the oceans, and beyond all physical barriers in the attempt to form new alliances with the Assyrians on the other side of the world. To separate ourselves from our brethren is to lose power, and to lose power forebodes defeat, disintegration and total unconditional submission to degenerating adverse conditions. But according to the word of God, the Assyrians shall live on, and once again they shall be one of His favorite handiwork on earth. Isaiah 19:23-25. The Assyrian Star congratulates the newly reelected officers of the Federation, and prays that the Supreme Ruler of the universe give them the power and the will to overcome all obstacles in the service of their people, and in the accomplishment of their noble aims. There is a joke in America that goes something like this: how can you tell the American-Assyrian conventions from the European-Assyrian conventions? In Europe, they move from a seminar room to another meeting hall, but in America people either stand in the hotel lobby or conspire against each other in the hotel rooms. This year, however, there may be more opportunities in San Jose to leave the lobby crowds and find an interesting and educational seminar to attend. To view the schedule of activities recommended by our staff, please click the image below. For a more complete list of events please visit the Convention website (click here). 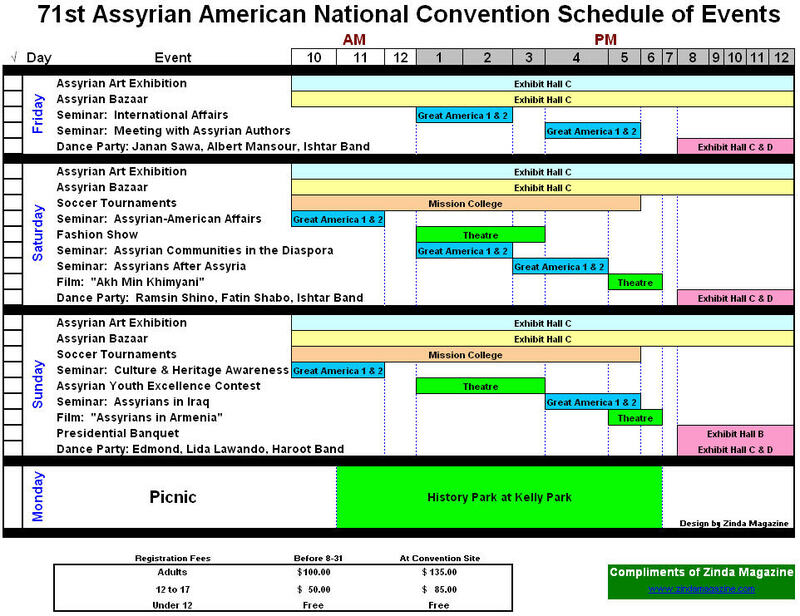 Events times are subject to change during the convention. For more information, see the Registration Desk at the hotel. ZINDA Magazine is published every Tuesday and Friday. Views expressed in ZINDA do not necessarily represent those of the ZINDA editors, or any of our associated staff. This publication reserves the right, at its sole discretion, not to publish comments or articles previously printed in or submitted to other journals. ZINDA reserves the right to publish and republish your submission in any form or medium. All letters and messages require the full name and telephone number of the sender and/or of the author. All messages published in the SURFS UP! section must be in 500 words or less and bear the name of the author(s). Distribution of material featured in ZINDA is not restricted, but permission from ZINDA is required. This service is meant for the exchange of information, analyses and news. To subscribe, send e-mail to: zcrew@zindamagazine.com.